Well, it's breakfast. 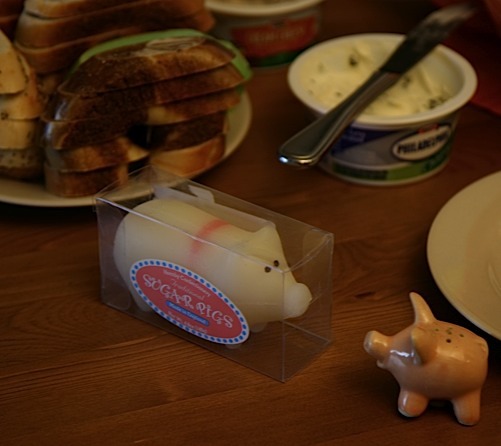 But I'm not talking about the cream cheese, the stack of bagel slices, or the little salt-shaker pig. (That's another story.) 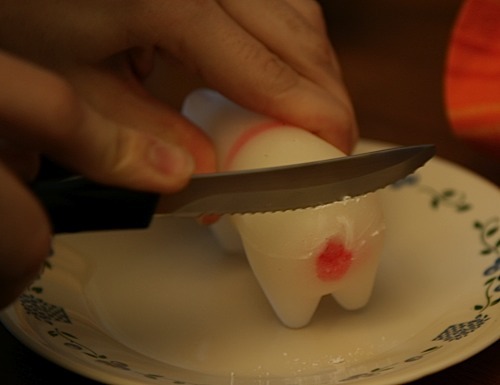 Is that... a pig made of sugar? 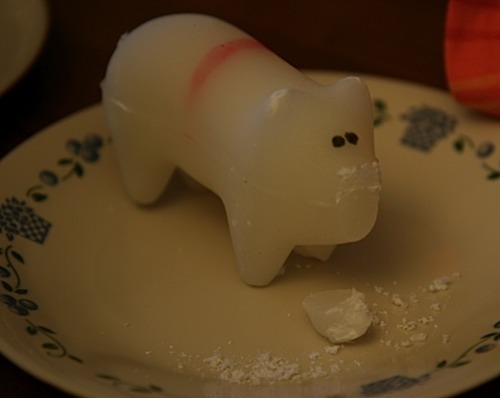 It's a Hornby Confectionary "Traditional Sugar Pig", made in England, according to the box. As far as I can tell, these are almost completely unattainable in the U.S., but I got three of them at a local Home Goods store on clearance for $3 each. Someone in England thought it would be a good idea to compress a bunch of confectioner's (powdered) sugar into the approximate shape of a pig, draw some eyes and pink accents on it, ship it across the Atlantic, deliver it to a store in New York, and hide it behind a bunch of crappy holiday cookies. Either someone lost money on this, or international shipping is a lot cheaper than I thought. Hornby also sells more common and much smaller sugar mice on sticks, which I assumed would be for adding sugar to coffee or tea in a convenient stirrable form that slowly dissolves into a hot beverage. But it looks like they're supposed to be lollipops. But where does that leave the pig? We decided to cut off parts of it for my coffee-sweetening theory, since the whole pig is far too large to be comfortably dipped into a cup of coffee. Cutting was amazingly hard: it took a lot of work to saw off a small section. I now doubt that this is the intended usage. The nose and legs were much easier to sever. We dropped pieces in coffee, which had no noticeable effect. One immediate problem with this usage theory is that since coffee is opaque at average cup depths, there was no way to tell whether the pig chunk had fully dissolved. In a feat of pure courage, Dan decided to eat a piece of the pig directly, and discovered that it doesn't just taste like sugar. The rest of us confirmed that it indeed bears a bubble-gum flavor in addition to its packed sugar. 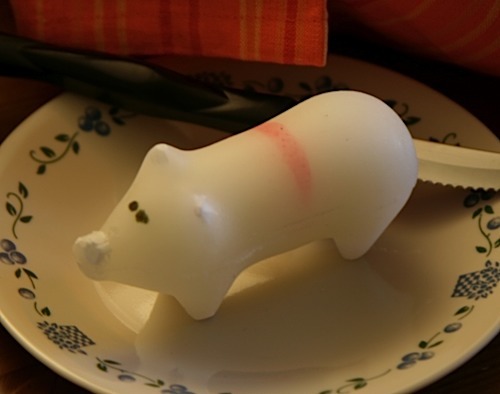 Clearly we did not use the sugar pig correctly, and its purpose remains a mystery.